Checking for registered DLL, OCX and EXE files on the computer is not easy. However, small utility RegDllView makes this real easy by pulling all information in one interface. It displays list of registered DLL, OCX, EXE files and their respective information in clean tabulated manner. You can right click on any specific registered file and perform different operating like: delete entry, re-register entry, un-register entry etc. It displays lot of related information for each registered file including: description, version, company name, product name, file attributes, create on date etc. 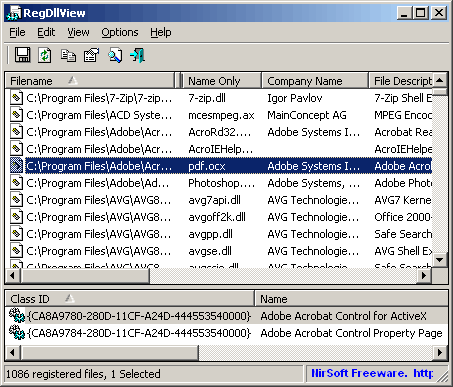 Download RegDllView, it does not require install – jut download, unzip and start using it.